Extremely economical. 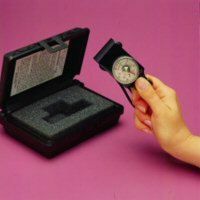 200 lb Jamar grip dynamometer, 60 lb pinch dynamometer, Semmes Weinstein hand set (6 monofilaments) Dellon MacKinnon 2 point discriminator, arm circumference measuring tape, finger circumference gauge, 6.75" EZ read goiniometer. 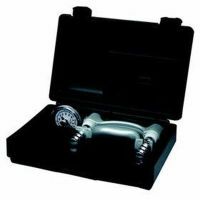 Packaged in sturdy foam padded plastic case. 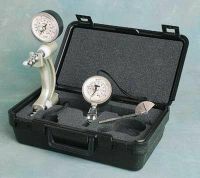 Jamar hand dynamometer 3 piece set. Dual-scale readout displays isometric grip force from 0 - 200 lbs. Peak-hold needle automatically retains the highest reading until reset. Handle easily adjusts to five grip positions, from 1 3/8" - 3 3/8", in half-inch increments. Unit comes with a carrying/storage case and complete instructions. Jamar Hand Dynamometer. 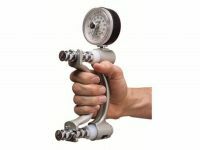 Dual-scale readout displays isometric grip force from 0 - 200 lbs. Peak-hold needle automatically retains the highest reading until reset. Handle easily adjusts to five grip positions, from 1 3/8" - 3 3/8", in half-inch increments. 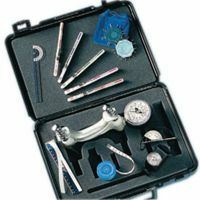 Unit comes with a carrying/storage case and complete instructions.